"Establishing a Legal Research Agenda for Ocean Energy" by Glen Wright, Anne Marie O'Hagan et al. The literature on ocean energy has, to date, largely focussed on technical, environmental, and, increasingly, social and political aspects. Legal and regulatory factors have received far less attention, despite their importance in supporting this new technology and ensuring its sustainable development. Building on the social sciences research agenda developed by the International network for Social Studies of Marine Energy (ISSMER) and published in Energy Policy, a complementary agenda for legal research linked to ocean energy was set out. Key directions for future research structured around the core themes of marine governance: (i) international law; (ii) environmental impacts; (iii) rights and ownership; (iv) consenting processes; and (v) management of marine space and resources were identified. Wright, Glen; O'Hagan, Anne Marie; de Groot, Jiska; Leroy, Yannick; Salcido, Rachael E.; Castelos, Montserrat Abad; Jude, Simon; Rochette, Julien; and Kerr, Sandy, "Establishing a Legal Research Agenda for Ocean Energy" (2016). 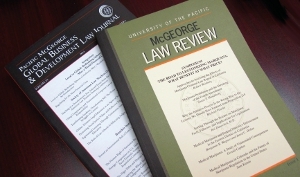 McGeorge School of Law Scholarly Articles. 326.